Oh man – that reminds me of some of the kids I get in the bookshop. Yesterday a little boy kept asking me ‘why?’ and at some point I got so confused I just stared at him. He did stop asking questions, though. 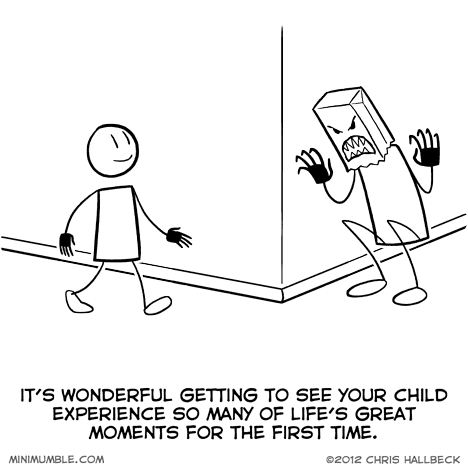 I imagine being a parent is like that, except all the time. So wait, Biff started on my birthday? From this day forward, he had a fear of The Unknown Comic. I interpreted this as asking whether gravitons have mass. Fortunately, by this point my son was perfectly willing to accept “I don’t know” as an answer. My daughter is starting a “why?” phase, but at this point (she’s only 3), if I get stuck on a question, I can just give a long, boring, scientific explanation which usually leads to her playing with her toys and forgetting what the conversation was about. Glad I paid attention in physics and biology (let’s hope she doesn’t go the chemistry rout, or I’m screwed). “What’s the future?” (smack) “well son, we were in the past, now we are in the present, and the future is bound to repeat itself.